Yes, it’s a touch on the early side to be thinking about Halloween, but retailers certainly don’t agree. They’re already putting out all of those fall season decorations. Well if you’re in a particularly festive mood, you might consider dressing up your iPhone for Halloween. 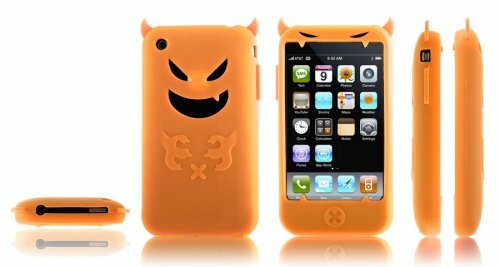 If that’s the case then you’ll definitely need this Demon Silicon Series Case for the iPhone 3G as well as the iPhone 3GS. No one will be able to mistake it as anything but a Halloween case. Between that bright orange and the Jack-O-Lantern smile alongside the demon horns, it’s pretty obvious. Of course you can get it in other colors besides the orange. It’s available in blue, yellow, white, green and purple as well. Perhaps one of those colors would make it appear a little less like a Halloween case and you’d be able to use it year round. You can purchase the case for $14.99. May have to look at adding these to our site.